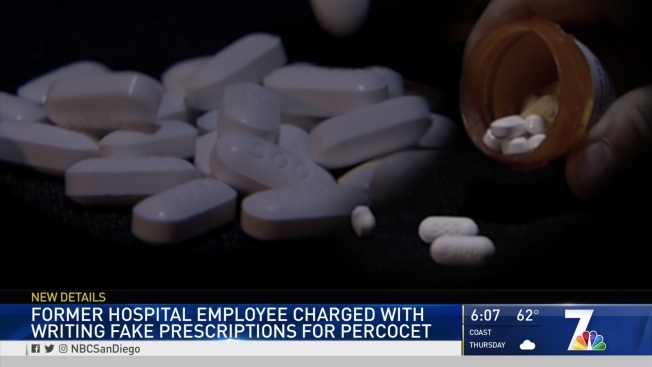 A San Diego woman, employed at a Southern California health care company, faces multiple federal charges for using stolen prescription pads to pick up thousands of tablets of Percocet at area pharmacies, according to a complaint filed Thursday. NBC 7 has obtained court documents showing Jessica Watson, 34, is accused of stealing 19,430 tablets of the powerful narcotic pain reliever over three months in the summer of 2016. However, in the complaint, federal prosecutors allege Watson admitted to investigators that she began filling out prescriptions from several doctors in October 2015. In her interview with Drug Enforcement Agents, Watson admitted to using names of her family members - her husband, her brother, her mother and her ex-husband, for example - without their knowledge and then picking up the prescriptions using her own identification. DEA agents say the family members were not patients of the doctors at the medical clinic. "Based on the fact that the daily quantity of opioid tablets acquired by Watson would have been fatal had she personally taken them, agents believe that Watson acquired the large amounts of SPDs for the purpose of distribution," the court document states. Watson accessed the stolen prescription pads through her position as an office worker at the Scripps Coastal Medical Center, according to the complaint. Although, the document does not specify at which location Watson was once employed. The complaint says Watson illegally obtained around 20,000 tablets of Percocet carrying a street value of up to $190,000. "One of the things I want to make sure we get across is that the internal audits at Scripps, they did a great job in identifying the problem and then bringing the problem to us," Colin Ruane, Assistant Special Agent in Charge with DEA, said. The DEA is reminding the public of its National Prescription Drug Take Back Day on April 27, where people can dispose of their unwanted prescription drugs free of charge.